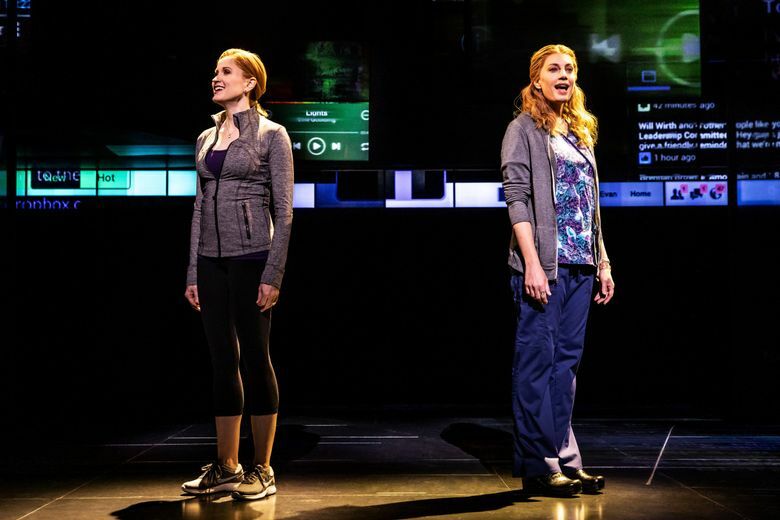 "Dear Evan Hansen," the Tony-garlanded musical about a high-school senior with a broken arm and social anxiety who ascends to quick, grim celebrity through a misunderstanding, plays at the Paramount through Feb. 2.
Who better to sit with during a touring production of “Dear Evan Hansen,” which has already been adapted into a novel by Little, Brown’s “Books for Young Readers” imprint and is on its way to becoming a film? If you’re not familiar with the “Hansen” phenomenon, a quick primer: It’s a relatively taut, two-act, Tony-garlanded musical about Evan, a high-school senior with a broken arm and a seemingly terminal case of social anxiety (his hardworking single mom is very worried) who ascends to quick, grim celebrity through a misunderstanding. Shortly into the musical, another senior — an angry cipher with ratty hair and a black wardrobe named Connor — kills himself. Before Connor commits suicide, he signs Evan’s cast with the vim of a vandal, writing “CONNOR” in huge Sharpie scrawl. He also snatches one of the daily notes Evan writes to himself on the advice of his therapist. 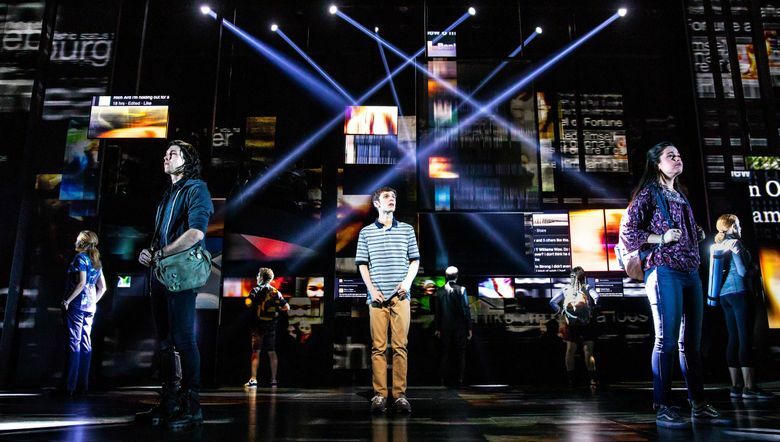 (“Dear Evan Hansen: Turns out this wasn’t an amazing day after all.”) Connor’s corpse is found with the note, which his parents assume was written to Evan. Evan’s cast reads “CONNOR.” Two plus two equals bereaved people desperate to latch onto any shreds from Connor’s pre-suicide existence, so Evan finds himself boxed into performing the role of best friend to a dead classmate he barely knew. Lies beget bigger lies, of course, and Evan becomes an accidental internet celebrity crusading against teen suicide. The whole thing is a sham (a noble sham, but still a sham) and Evan’s moral dilemmas are as thick as chocolate syrup — set to a pop-inflected, fraught-but-honeyed score. I agree — and we weren’t disappointed. Large screens dominated the stage, best used for email threads and social-media feeds, physicalizing the distracted mental state of being online. The online repercussions of the characters’ flesh-and-blood decisions were always looming just above and behind. I concur. And I still owe her a dollar.